With World of Warcraft comic books, action figures, t-shirts and trading card games already thoroughly merchandised by Blizzard and their partners, what's left to license? How about World of Warcraft coins? DC Unlimited is making 'em, legitimizing WoW gold selling. 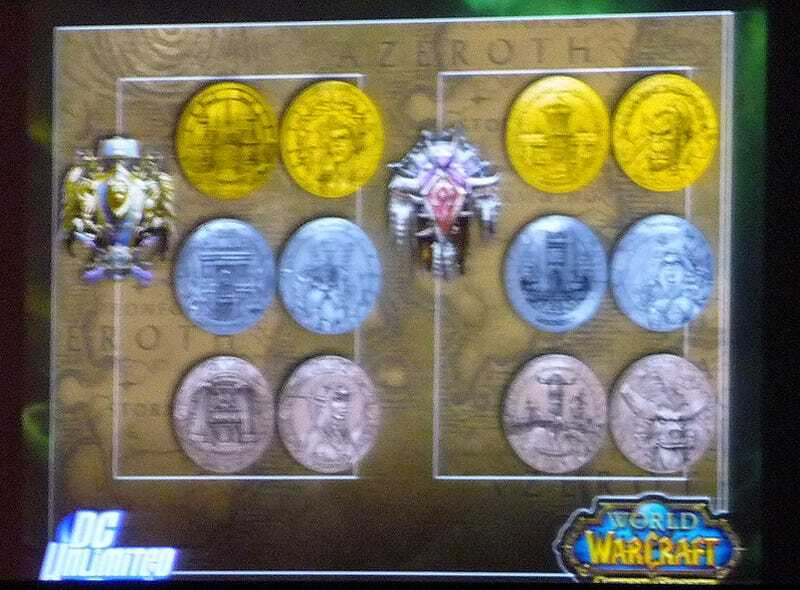 Both the Horde and Alliance will get 24 karat gold plated, Sterling silver and copper coins, based on the gold, silver and copper pieces used in World of Warcraft's currency system. No price or release date announced at Comic-Con, but don't expect to be able to cash these in for a flying mount. Sounds like they'll be packed in a display box, the kind of thing we don't expect to be cheap. They'll probably look a lot better in person than the shaky digital camera shot above.